The Upper Iowa University Homecoming Committee invites you to get your creative juices flowing and help create this year’s theme! 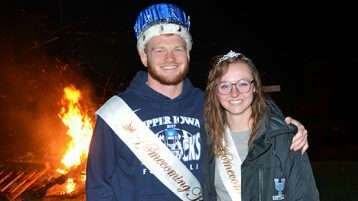 UIU is excited to host the 102nd Annual Homecoming celebration October 3-5, 2019. Last year’s theme, “Peacock Pride Ignited…It’s Lit,” was a huge hit and we’re hoping to unveil another fun theme for the festivities this year. Please e-mail your theme idea(s) to alumni@uiu.edu. Include your contact information and a brief description to explain your submission. The deadline to submit ideas is Friday, February 1.